The growing season where I live would never be considered long. Even in a year with an unusually early spring, like 2010, the season is no more than five months long. And, with a later spring, like this year, we’re lucky to get four full months of good gardening in. But on a recent trip to the North Shore of Minnesota, I was struck about how intense a much shorter growing season is. Driving up Highway 61 from Duluth to Grand Marais and then Grand Portage, my husband and I noticed the vast numbers of lupines in the ditches. This prompted choruses of the Monty Python classic song, “Dennis Moore, Dennis Moore,” in which the inept Robin Hood demands lupines for tribute, but it also struck me as late for lupines to be in bloom. Mine usually bloom in early June. In a short season, the plants bloom rapidly, making for unusual combinations of bloom. 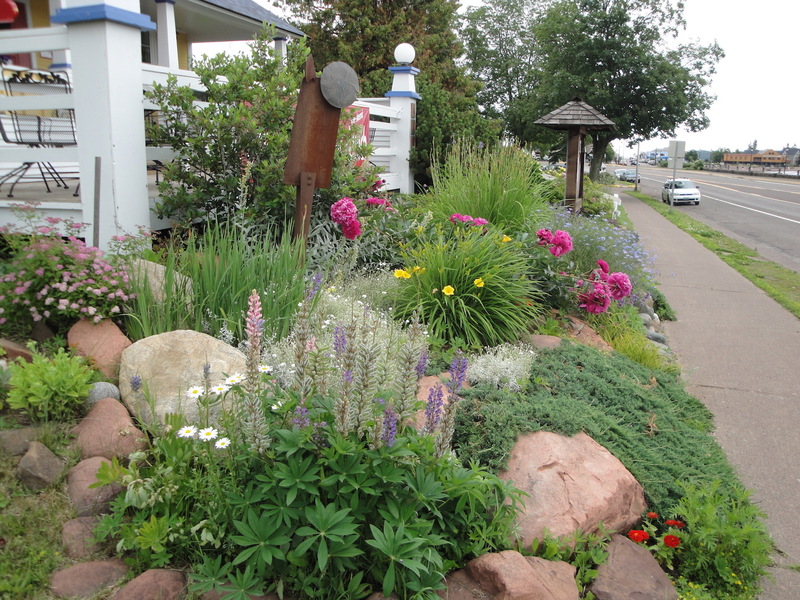 When we got to Grand Marais, the city’s gardens were in full, glorious bloom – with all the plants that have bloomed in my garden since late May blooming simultaneously. Instead of a series of blooms, from lupines to peonies to roses to spirea to daylilies to lilies, all the blooms were out together. 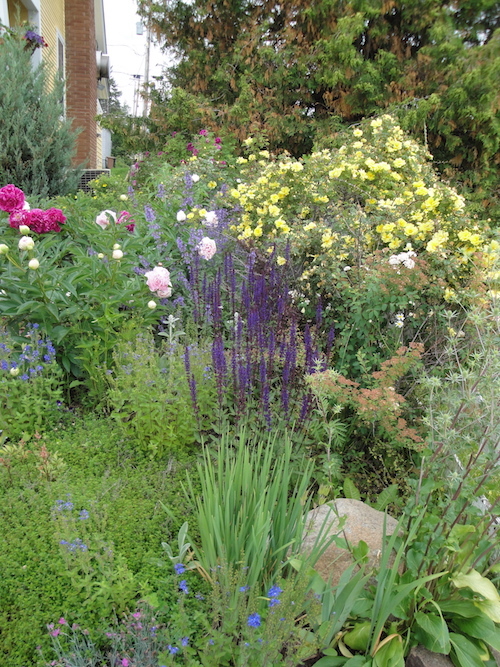 The front yard garden in the photo is one example of many that I saw, wildly in bloom as if May, June, July were one month. This must present challenges to gardeners, both practically and emotionally. Not only do they have to anticipate how their flowers will look together, once they have all bloomed – then what? My guess is fall color and a long, gray winter. Luckily, they have those big views of Lake Superior for solace. Gardeners Up North, as we Minnesotans say, must relish every moment of the season. Seeing their short-season gardens led me to cherish our longer short season even more. « Storm Damage or Garden Opportunity? Yes, we northern gardeners do have to pack as much into our short growing season as possible. It does seem very late for lupines to be blooming, but this is a strange year. We’re either snowing or sweltering; there’s no in-between!